While my friends enjoy Scene It, poker, Taboo and Charades, it seems that movie characters often prefer to play “Hide the Dead Body” given the number of times a person ends up dead-- one way or another-- and instead of dialing the men in blue (the police that is, not the Las Vegas group), they start grabbing bags or sheets or shoving it from sight. In a movie like Clue that incidentally is based on a party game, it’s done for laughs when the bodies just won’t stay dead but it’s also a device used by thrillers or comedic thrillers such as in this 1996 American remake of the Norwegian film Hodet over Vannet. 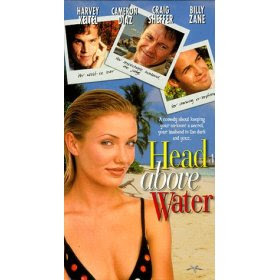 A few years before the world realized that There’s Something About Mary, actress Cameron Diaz found herself the target of affections from a trio of other slightly deranged males in Head Above Water. Putting her wild days of booze, pill popping and Billy Zane behind her, young, beautiful Nathalie marries her much older judge George (Harvey Keitel). At first George reminds viewers of the dashing Colonel Brandon from Sense and Sensibility—not conventionally handsome but attractive in his devotion to his young wife but soon the audience, like Nathalie begins to realize that there’s much more to both George as well as her none-too-content to be platonic friend Lance (Craig Sheffer) that meets the eye. The masks come off after Zane returns while the men are on an overnight fishing trip and after a night of flowers, chocolates and vodka Zane's found dead in Nathalie’s bed. Fearing the worst from her controlling husband whose fits of jealous rage in the past may have had Tony Soprano taking a few notes, Nathalie decides to play (you guessed it) Hide the Dead Body until of course, she is discovered by her husband and rather than phoning 911, they decide that they can’t take a chance that twelve angry men and women would decide to send them to prison on suspicion of murder. As is always the case, one lie builds on another until we realize there’s something dangerously sinister about the whole bunch but the film is surprisingly effective—breezy and unpredictable at the beginning until the tone and color palette changes when things take a criminal turn in a work that Variety called a “fine showcase for Diaz’s fast-developing acting skills.” Although for my money, nowhere near as fun as a game of Scene It with good friends, watching Keitel and Diaz play Hide the Dead Body is far more entertaining than several of the darkly comic amoral thrillers like Very Bad Things and The Last Supper (also starring Diaz) that populated the 90’s.